If you’re not grinding the meat yourself (me either! ), ask the butcher to grind it coarsely, since it’s not typically available pre-ground. If you can’t get coarse ground meat, standard ground meat will do! Fatayar freezes well in a zip lock freezer bag and can be reheated from frozen in a 250 degree oven. Serve fatayar warm or room temperature as an appetizer, or for a meal with a salad. Makes about 24-30 fatayar. 1. Proof the yeast by dissolving it in ¼ cup of the warm water with the sugar and letting it activate for about 15 minutes. 2. 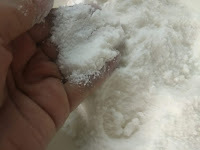 Whisk together the flour and salt in a mixer bowl or medium bowl. Create a well in the center and add the oil and proofed yeast mixture. Using a stand mixer fitted with the hook attachment or by hand, slowly work the wet ingredients into the dry, adding the remaining 3/4 cup water slowly. 3. Knead by hand or with the dough hook in the mixer until the dough is very soft, smooth, and tacky/sticky to the touch (but it should not leave dough on your fingers when touched). 4. In a clean bowl at least twice the size of the dough, lightly coat the dough and the sides of the bowl with oil. Cover with plastic wrap and let rise in a warm spot until doubled, about 90 minutes. 1. Preheat the panggangan to 375 degrees. Brush two heavy baking sheets with canola oil (fine to line them with foil first for easy cleanup). 2. Roll the dough out on a dry work surface to 1/8-inch thickness. Gently lift the dough from the edges to allow for contraction. Cut dough into 4-inch rounds. Knead together the scraps, cover with plastic, and set aside. 3. Fill the rounds of dough by placing a heaping tablespoon of filling in the center of each round. Be careful not to let the filling touch the edges of the dough where it will be gathered together and closed. A good way to keep the filling in the center is to lower the spoon with the filling over the center of the dough (parallel to it) and use your fingers to slide the filling off the spoon and into the center of the dough circle—or just use your fingers and no spoon. Place several pine nuts on top of the filling; this method works better than adding the nuts to the filling because it’s easier to be sure each fatayar has enough nuts. 4. Bring three sides of the dough together in the center over the filling and pinch into a triangle. Close the dough firmly, continuing to shape the fatayar gently as you pinch the seams closed. It’s also okay to leave an opening at the top of the fatayar. 5. 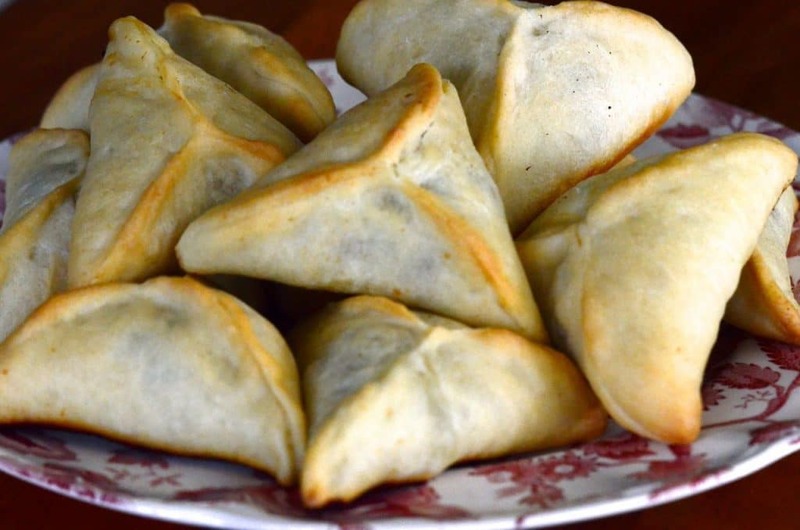 Place the fatayar on the baking sheets and generously brush or spray the dough with olive oil. Bake in the middle of the panggangan for 18-20 minutes, or until golden brown. 6. Repeat the process with the other half of the dough, then with the scraps that have been kneaded together and left to rest for a few minutes before rolling out.